In response to yesterday’s post on management design patterns, many readers asked for examples of best practices. So I’m going to write about the management best practices I have been taught and I have observed in startups. This is the first post of that series. 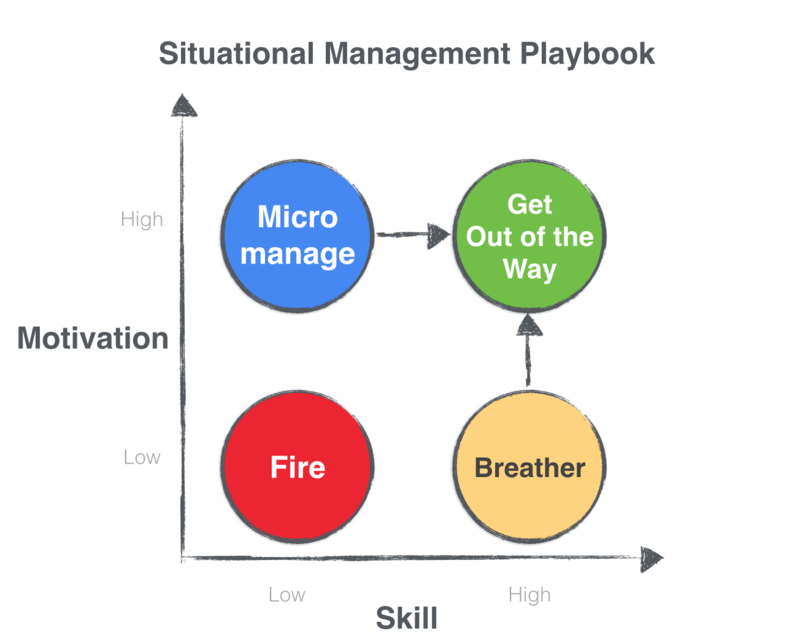 The first management technique is called Situational Management, one that my wife, a terrific manager at Google, taught me. Low motivation, low skill: this one is pretty easy. The person hasn’t been placed in the right role or hasn’t been able to understand how to be effective within the company. It’s time for the company and employee to part ways. High motivation, low skill: the most typical state for an employee to be in after he has been hired or promoted. He is excited and energetic but unfamiliar with the particulars of the job, or the company, or the culture. Somewhat counterintuitively, the best management technique in this situation is micromanagement. Despite its reputation, micromanagement is a powerful management tool in this situation. The manager must convert the employee’s motivation into skill so the employee will become effective and feel valued. The best way to do this is by frequent check-ins, updates, and feedback. Applied this way, micromanagement provides the employee very fast and very short learning cycles. Each day, the employee receives a mini-review of his work. Within a few weeks, the employee have learnt quite a bit and become productive. Low motivation, high skill: aka burnout. Employees reach this stage after working hard for an extended period of time. The biggest risk for managers with employees in this quadrant is losing them to another employer because of frustration or disillusionment. A manager ought to put this employee “out to pasture” for a week or a few weeks, meaning allowing her to work on self-directed projects or projects of passion to recharge her motivation. High motivation, high skill: this quadrant contains high-performing employees, the ideal state. The best management advice is to get out of the way. Situational management is a simplifying framework to help managers identify the state of each employee and provide the right support to help them fulfill their potential.